After running the Jazz successfully over the past week, does Donovan Mitchell have a future at point guard? Ricky Rubio was a full participant in Jazz practice on Sunday for the first time since injuring his hamstring in Milwaukee back on Jan. 7. With Rubio, Dante Exum, and Raul Neto all having simultaneously missed significant time the past few weeks, though, Donovan Mitchell has had no choice but to take on more of the roles traditionally associated with “point guards,” such as ballhandling and directing the offensive sets. Considering the Jazz have won six straight games, though, has Mitchell shown enough in the role these past few games that, if Rubio suffered some kind of long-term setback, he could simply take over? Or, what if it didn’t have to be out of necessity? As some Jazz fans have wondered during Rubio’s absence, with the Spaniard set to be an unrestricted free agent this summer, might there be consideration given to simply turning the role over permanently to the Louisville product? Has Mitchell proved to be someone capable of handling the role on a full-time basis, in the vein of a scoring point guard like, say, Damian Lillard, who, coincidentally, will be visiting Vivint Smart Home Arena on Monday night with the Portland Trail Blazers? To a man, the Jazz have credited Mitchell with stepping out of his comfort zone and taking on more responsibility, noting the impact he’s had in keeping things running during the winning streak. So, is that good enough? Those numbers won’t remind any Jazz fans of John Stockton, certainly, but then, nobody is expecting that these days, either. Fair enough, though there have been some significant variations. Per the statistical and situational analysis site NBA WOWY, the Jazz’s season-long team offensive rating with Donovan as point guard is 104.9, vs. 108.9 with him as the shooting guard. Further, as Snyder likes to point out, Mitchell as “pure point guard” is something of a red herring anyway; the coach likes to employ a system of “primary” and “secondary” ballhandlers, making liberal use of Joe Ingles being the orchestrator (as he was this past Wednesday vs. the Clippers), while others such as Jae Crowder or Royce O’Neale or even rookie Grayson Allen take turns bringing the ball up the court and initiating. And indeed, when Mitchell has taken the court without Ingles during this stretch, the team’s offensive rating dips to 100.5; but when they’re playing simultaneously, it jumps all the way to 118.5. For his part, Mitchell acknowledges it’s an imperfect fit at the moment, but that he’s simply been doing the best he can to get the team by. Mitchell does concede that having the ball in his hands more has empowered him to play more aggressively, as he now has a better understanding of where his looks can come from within the Jazz’s schemes. And he also said he has “gotten to the point where I feel mentally comfortable,” mostly because he’s become better at knowing where the four teammates on the court with him are going and what precisely they’ll be doing. For what it’s worth, Snyder was a bit taken aback at that revelation. About the Jazz • Point guard Ricky Rubio, who injured his hamstring on Jan. 7, was a full participant in Sunday’s practice. 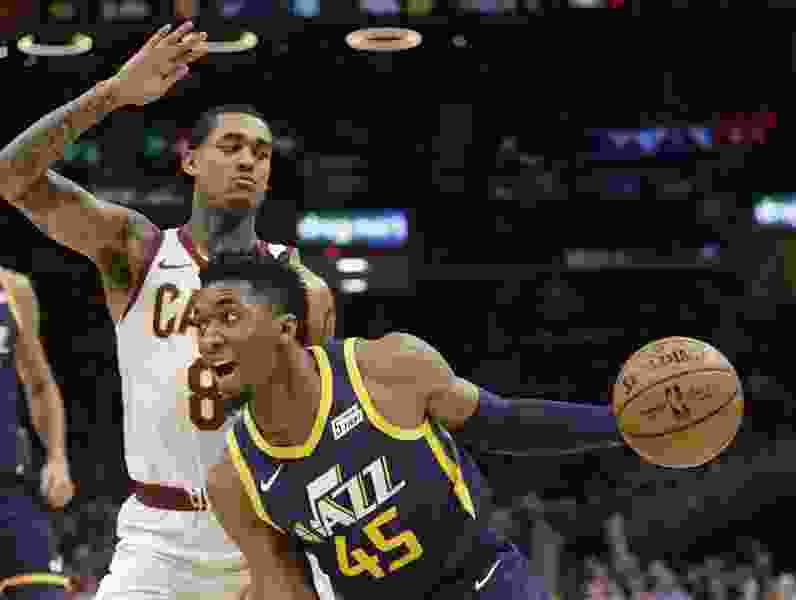 … Utah is coming off a 115-99 victory over Cleveland on Friday, the team’s sixth straight victory and a game in which they led by as many as 38 points. … The Jazz are up to fourth in the NBA now for season defensive rating, at 104.4. About the Trail Blazers • Portland is coming off a 128-112 victory over New Orleans on Friday. … Portland ranks second in the NBA in rebounds per game (48.1) and third in free-throw percentage (81.5). … Weber State product Damian Lillard leads the team in both scoring (26.1) and assists (6.1). He is also shooting 37.8 percent from deep.